Today a large superyacht hull was launched at Slob shipyard in The Netherlands where most of the new Feadship project hulls and superstructures are built. According to the pictures, the size of the hull hints that it should be the 92.5m hull 1005. Built in steel and aluminium, this project has a gross tonnage exceeding 2,900 GT. 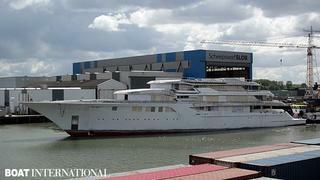 She is one of the numerous new orders that Feadship signed last year. Few details are known at this time with Feadship withholding comment, but the shed in Makkum would be ready to welcome hull 1005 following the recent delivery of Madame Gu. We will have to wait for 2015 to see this impressive yacht complete.